Tri-Rail is working to begin service to MiamiCentral by the second quarter of 2018, according to Miami Today. The start date depends on Brightline starting by year end, and on equipment modifications to meet new federal guidelines. Tri-rail service is expected to start six months after Brightline service begins. Brightline says that they will start up before the end of 2017. Dude how many times must you be told that it is “should have” not “should of”. Get it right. How about a comma after Dude? It’s a start, but how about some useful commuter rail along the Biscayne Tracks? This is amazing.. Great thanks to AAF for giving our community a direct tri-rail link to downtown Miami. 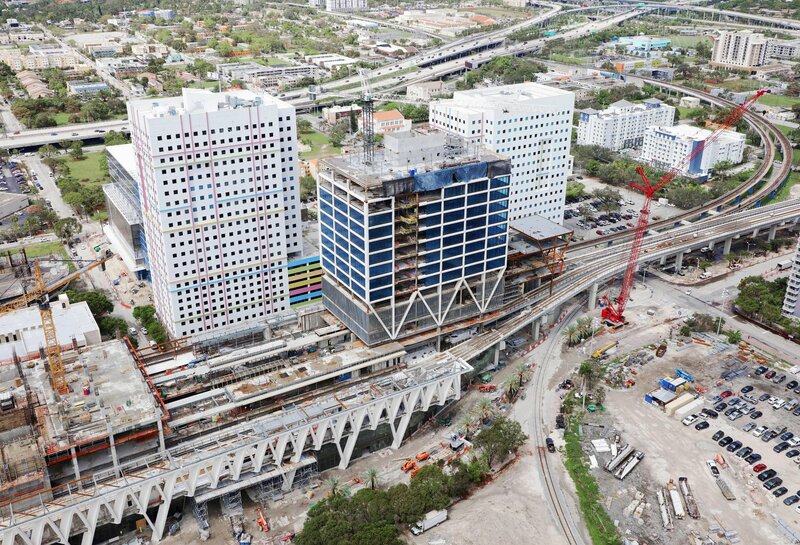 Construction is full speed ahead and we as a community will spend very little and get a world class train station in the heart of Miami. Extend the orange line into south beach. Imagine the orange line from Miami international airport , down town Miami and stopping into south beach. It will be a game changer. Get it done. And make it an elevated stations. It would be easier to build if Culmer is last eastbound common station. Put one in Overtown, at Museum Park for Metromover transfers, Watson Island, and over MacArthur Causeway to the Beach. Unfortunately, there’s no money for it, and many MB residents have objected to elevated guideways in the past. Development of well seven day a week affordable and smart rail service up and down the coast will make or break Miami . We want to be a world class city, lets start with rail service. Are you really calling our commuter nightmare “surviving”? Meanwhile, the Amtrak station at MIA that has been finished for years sits unused due to the inability to put down 200 feet of additional platform. Actually–Amtrak admitted it was their error when they submitted their Facility Impacts to FDOT and the SFRTA. Then the closure of (25th St?) was out of the immediate question. Thus–the too-short platforms! For ONCE it is not the fault of the Banana Republic of Miami Dade! lmao I was thinking the same, I passed by the station yesterday and at the earliest it would be opened by late December with much of it still closed off. I highly doubt Brightline serves Miami by the end of 2017. Maybe they really meant mid-2018 all along.